Injury Update: Disney’s Princess Half and Dopey 2018! Not to sound super whiny or anything … but my year so far hasn’t been great. Between a nasty sinus infection that still has me hacking up funny things and a migraine, I’ve been mostly sick. And stressed, since my husband is getting a hip replacement next Tuesday and we’re SO NOT prepared! Add to this the fact that the 2017 Princess Half Marathon is now less than SIX WEEKS AWAY and <<disclosure time>> I’m in horrible shape. As in, not able to walk to my mailbox let alone 13.1 miles from still feeling sick and toxic. But I refuse to freak out … much. Instead, I slowly climbed back on the wagon last Friday as a part of my yearlong Recover, Run, Rejoice plan. and when I say run, I mean all the races – local, non-local, Disney, what have you, where I will.. This is especially important now that WE’RE REGISTERED FOR THE 2018 DOPEY CHALLENGE!!!!! Yes, Jackey, Rob, and I took the plunge yesterday and purchased race bibs from a travel agent since the packet only required a two night Disney resort stay and no park tickets. Oh my goodness. I’m so excited. I’m so excited!!!! 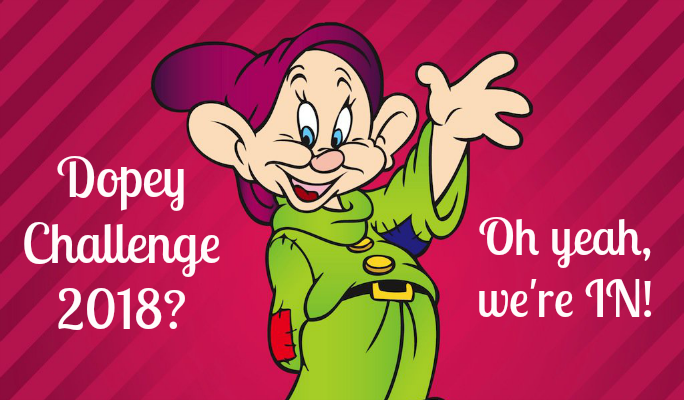 I love everything about the Dopey Challenge, which I covered in this 10 Reasons why you should do the Dopey Challenge post last year. So. I have a long year ahead of me, all of which I will be documenting in a Recover, Run, Rejoice vlog series on our YouTube Channel. Be sure to check it out and if you have had any experience getting a cortisol shot in a ligament, please let me know how that turned out! Until then, happy running and have a joyful day! Yay Dopey 2018! I’m not registered yet, I’m going to try and register with the regular folks, but it sounds like you got a really sweet deal through the agent! I’ll be sending good thoughts your way – healing thoughts for both you and your husband. I’m excited out of my mind for Princess – my most favorite time of year 🙂 Hopefully I’ll get to see you guys there! Thanks for the good thoughts – Bob is doing amazingly well. And let me know if you’re planning on going to the PHM We Run Social event, whenever it ends up being! First full and first Dopey?? Nah, not crazy at all, sounds perfectly logical to me!! 😉 Seriously, though, Dopey 2016 was Megan’s first full and Goofy 2015 were firsts for Jackey and me. As long as you commit to your training plan, you’ll be fantastic. And having your first full be at Disney will make it seem even more magical … with some awesome bling!